Such a great visit to Death Valley. We are still reading a few books we picked up about the character Death Valley Scotty. 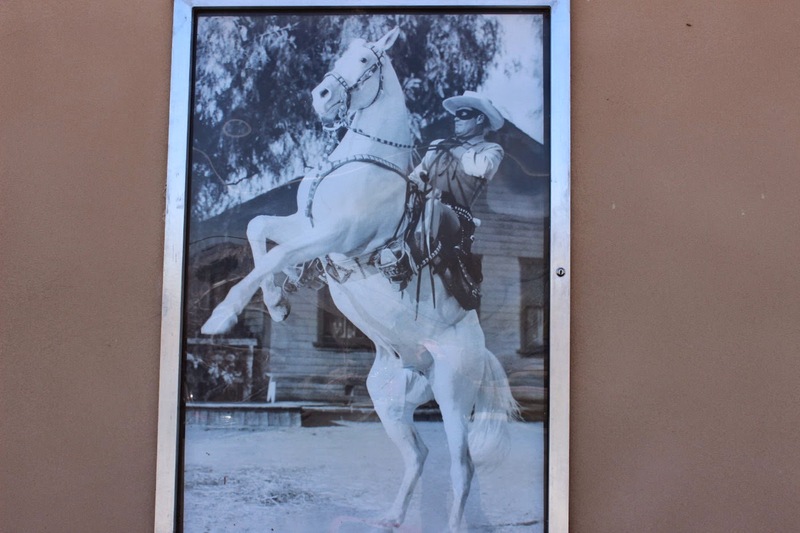 A gold prospector, for many years a member of Buffalo Bill's Wild West Show as a trick horse rider and shooter, and yarn spinner that persuaded a millionaire from Chicago to build the elaborate Scotty's Castle. 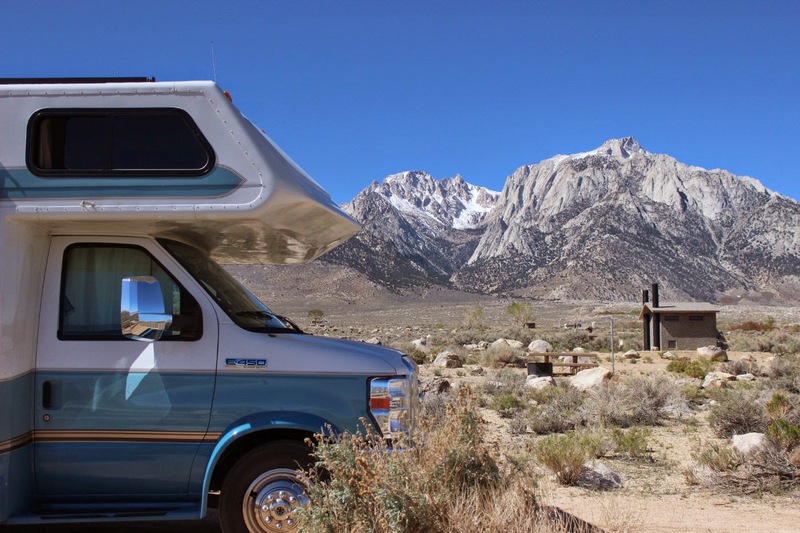 This is Lady Blue's view from our campsite at Tuttle Creek BLM in Lone Pine. The 12,944 foot massive mountain is very impressive. Partly, because you see it rise steeply out of the high desert. 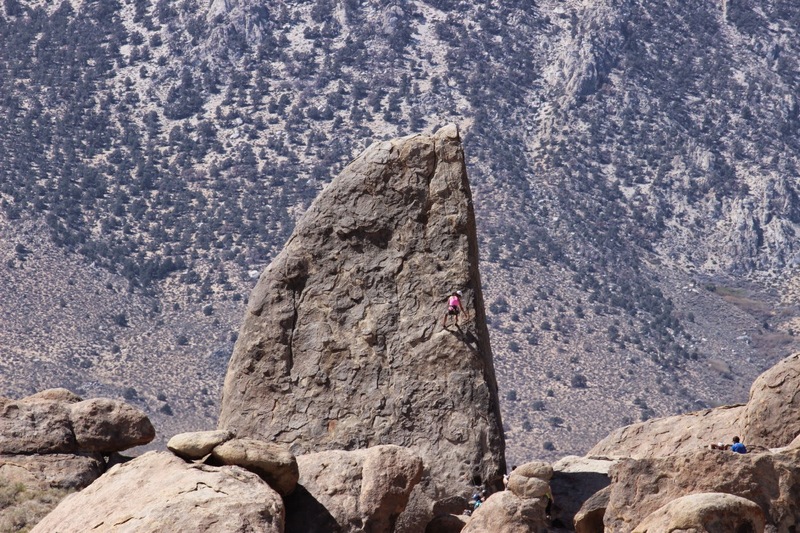 This link gives you some more inormation on Lone Pine Mt. Lone Pine Mountain info . As we explained in the last blog, Jan and I have been happy to stay here at $2.50 per night with our Senior Pass. Not only the view, but the nights are cool , in the low 50's or 40's, and the days are dry and warm,70's and 80's. 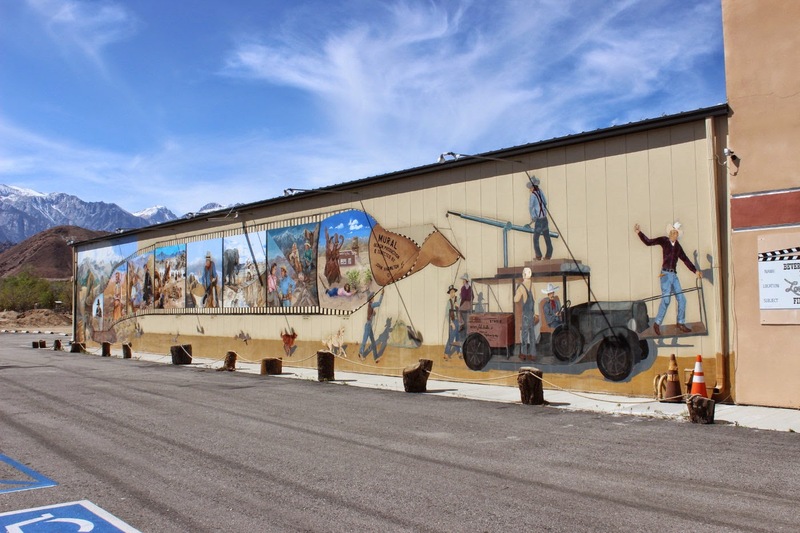 A short ride of about 7 miles brings us to the Main Street of Lone Pine. The route from Death Valley requires a fairly quick ascent over some very interesting roads. Keep a sharp lookout Eustis!! 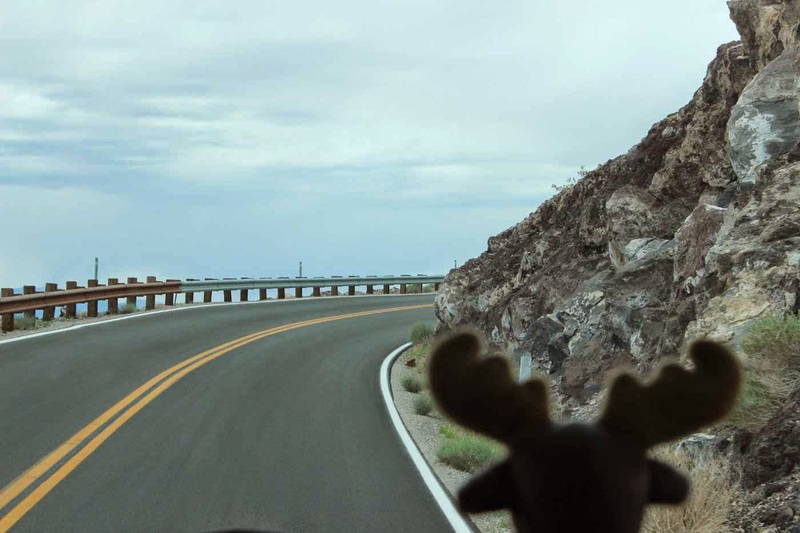 From Route 190, we connect with Route 136 down into Lone Pine. 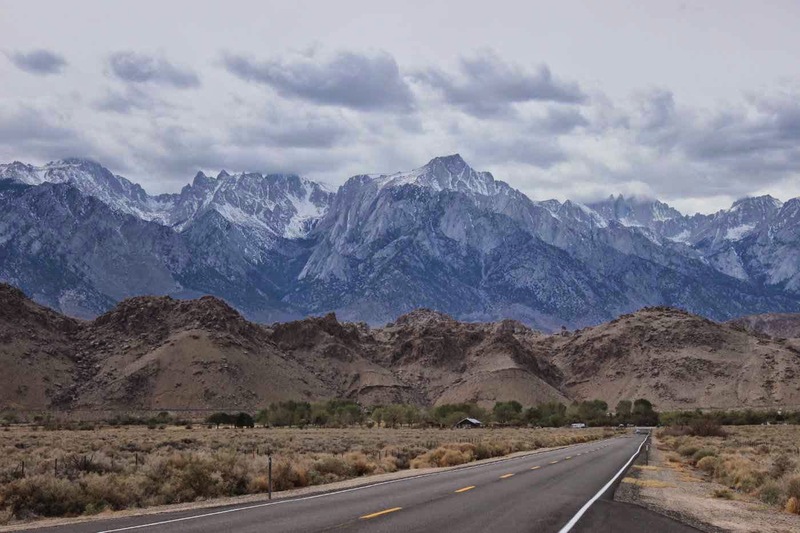 As we follow the road around Lake Owen, we are treated to this glorious view of the Eastern Sierra Mountains. The tall mountain a little left of the road is Lone Pine. 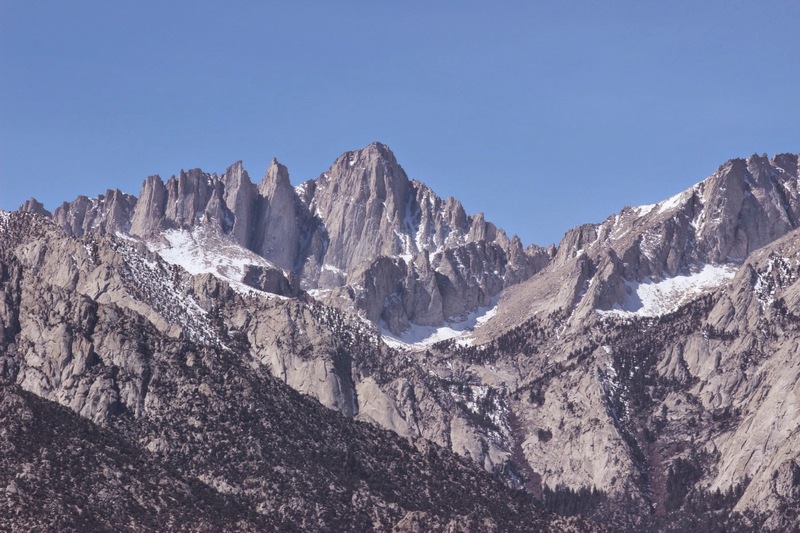 Mount Whitney, though taller at 14,496, is a little to the right where you see 3 plus sharp peaks. It looks shorter because it is further away. Our campground is an LTVA, which means Long Term. For $300, you can dry camp here(water and dump station in the park) from the first Saturday in March to November 1st. Yes, figure 8 months for $300!! A young gentleman lives in this remodeled 60's?? camper and works in town. Note the stove pipe addition. 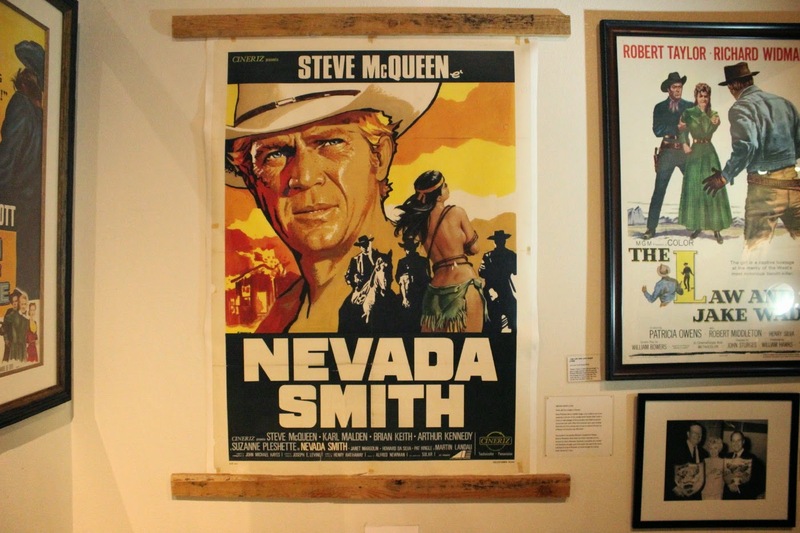 A highlight of Lone Pine is the Lone Pine Film History Museum. 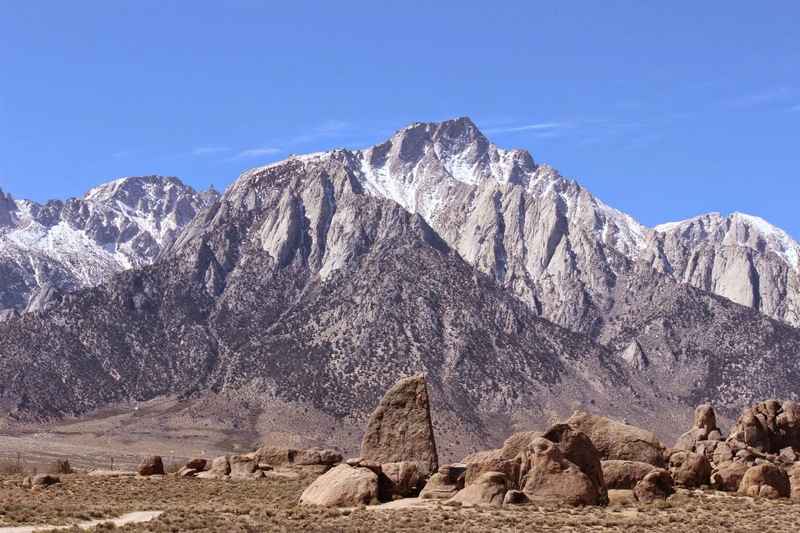 Starting before the 1920's, Lone Pine and the Alabama Hills(on the way up to the mountains you see in the background), were host to over 400 movie sets beginning with silent Westerns. 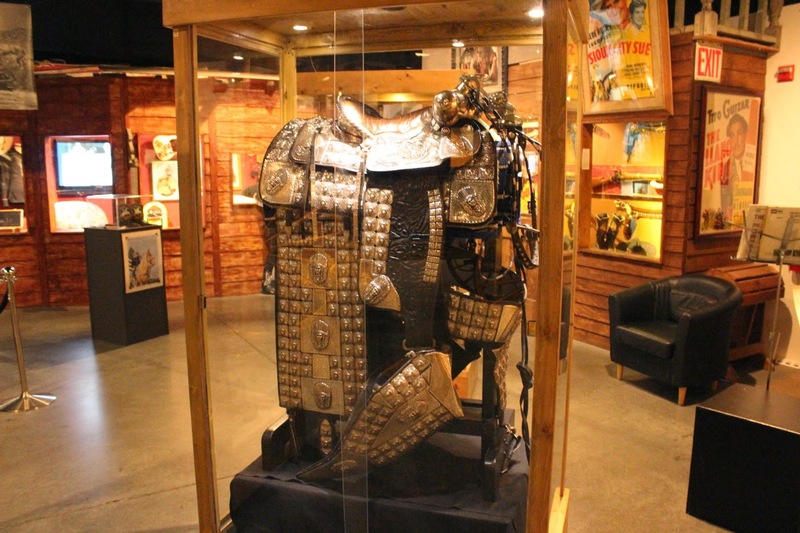 As you can see from the link, there is a ton of information in the museum. It hits home to people of our advanced age because we grew up with the westerns that were filmed here. 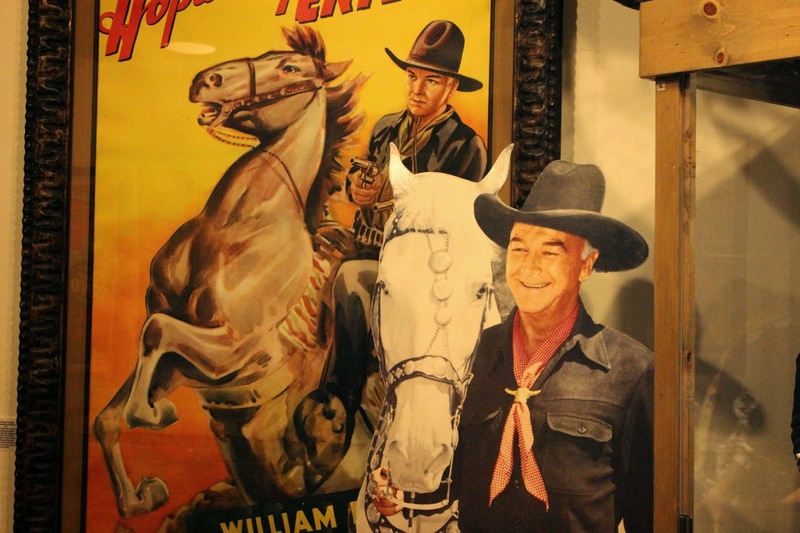 We watched Hopalong Cassidy, to the left, who perhaps filmed the most at this location. 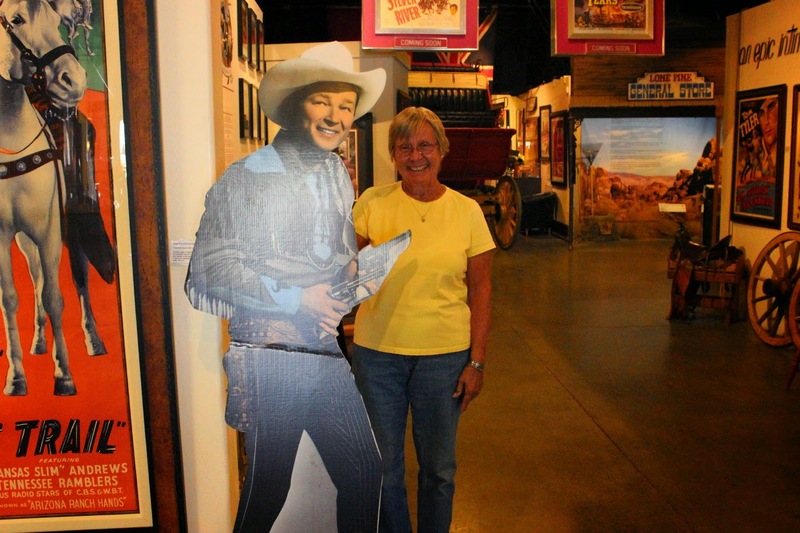 We also watched Roy Rogers who filmed his first movie here in 1938. We remember not only Roy, but also Dale Evans, definitely Trigger, Bullet ( the pet German Shepherd wonderdog), Pat Brady sidekick, and the jeep Nellybelle that would often take off driverless with Pat Brady in pursuit. The TV show ran from 1951 to 1957. That was in black and white for you younguns. Some of the pieces here are from the collection of the owners Beverly and Jim Rogers( a TV owner and philanthropist , not related to Roy). We were allowed to take non-flash pictures here. This is a hand made silver saddle. 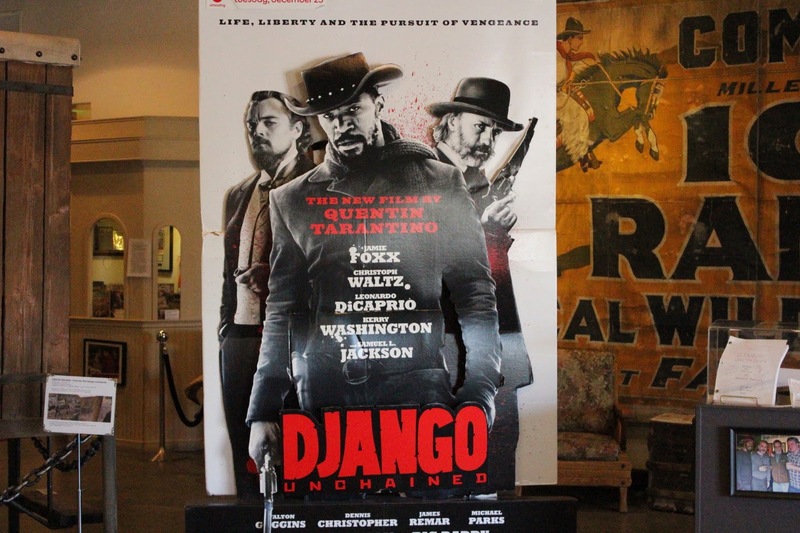 The museum is loaded with many film posters. 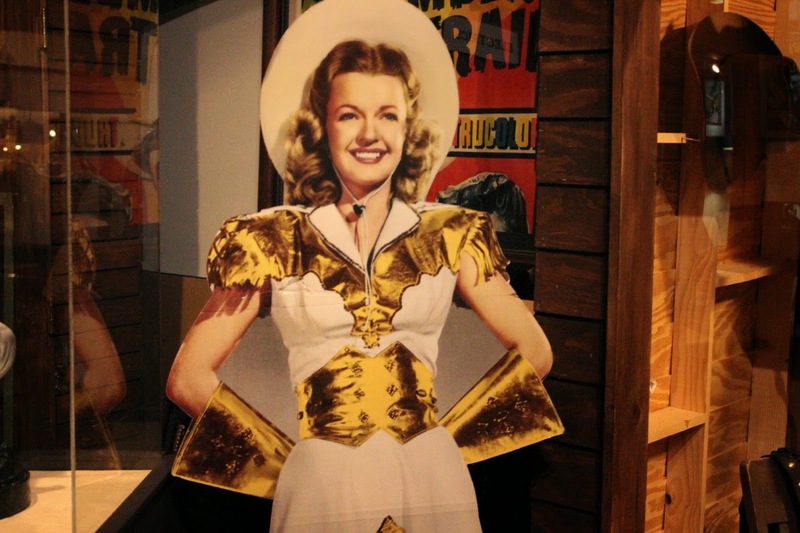 How could we not include Dale Evans. 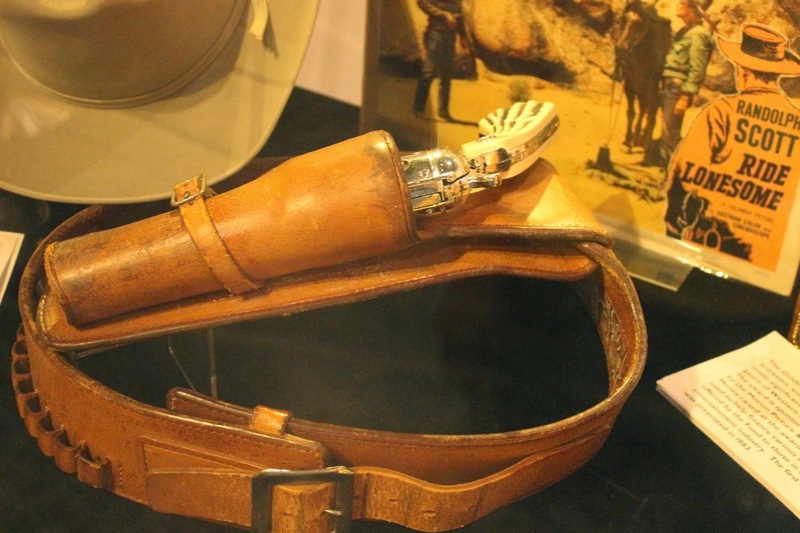 Another well watched TV series was the Lone Ranger. All together now: duh----duhduhduh-----duhduhduhduhduhduhduhduh---well , you know. That opening for the series---not the picture to the left---was filmed in Lone Pine. 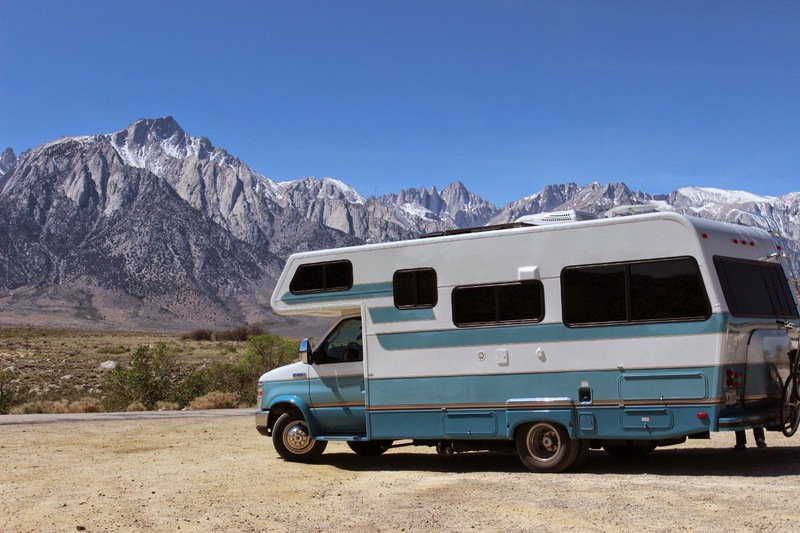 The artwork in the background shows the Alabama Hills , just a few miles up the road towards the mountains. 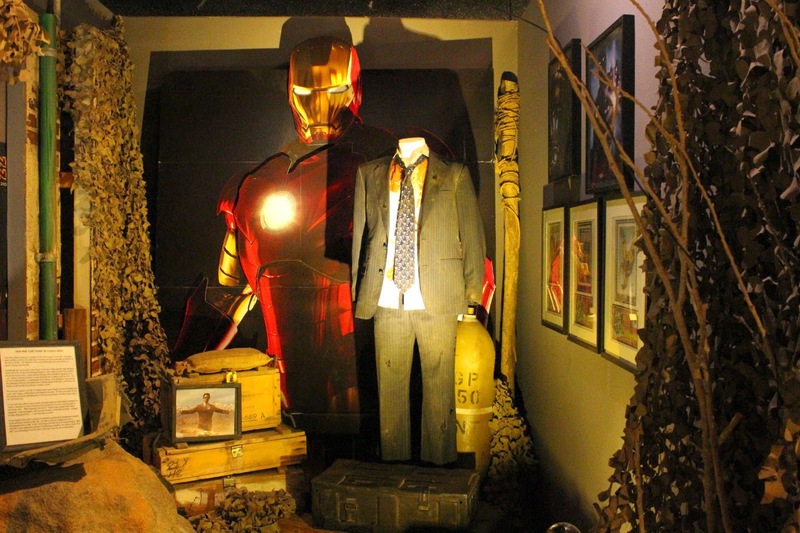 The museum exhibits included many items we all remembered. 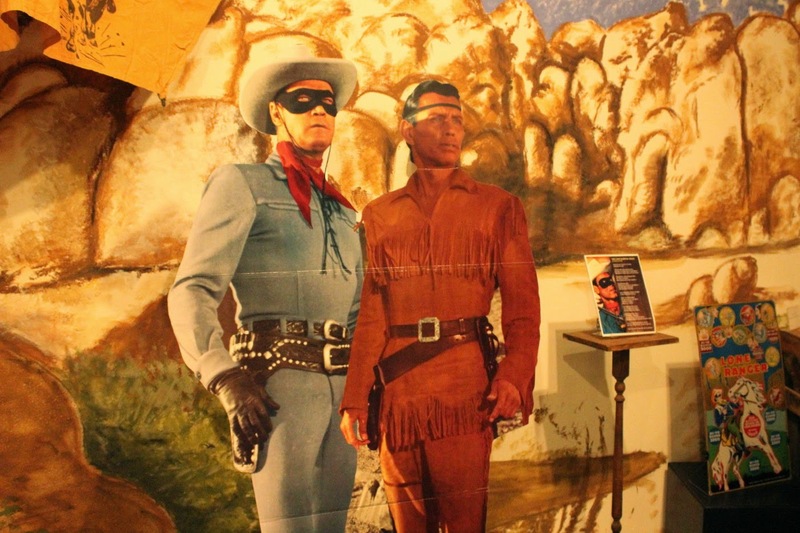 Did any of you have a Lone Ranger lunchbox or Roy Rogers, or Hopalong??? How about a toy handgun?? 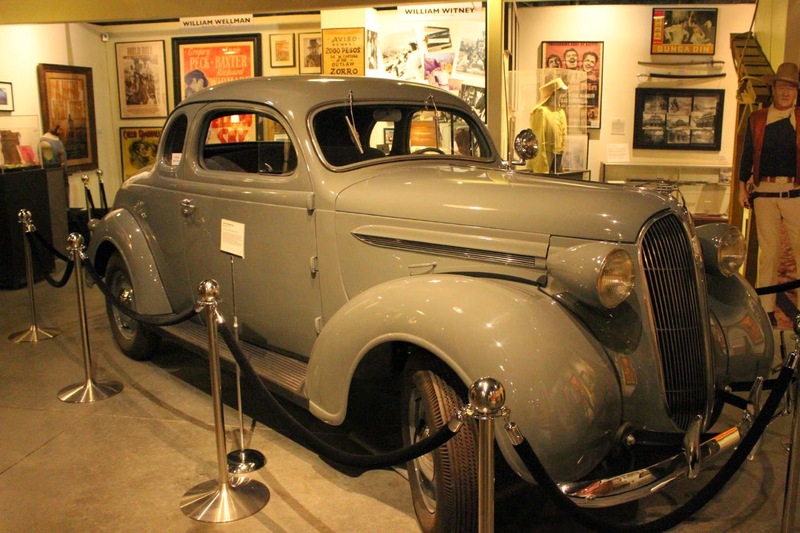 This 1937 Plymouth Coupe was driven in the 1941 movie High Sierra by Humphrey Bogart--racing up the Whitney Portal Road. 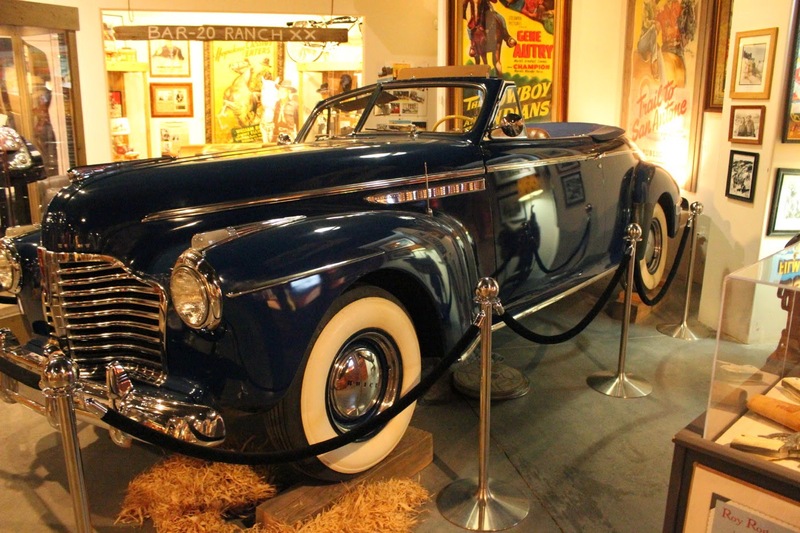 This 1941 Buick Eight Roadmaster was jumped over by a standin for Gene Autry, riding Autry's horse Champion. The Trail of San Antone. 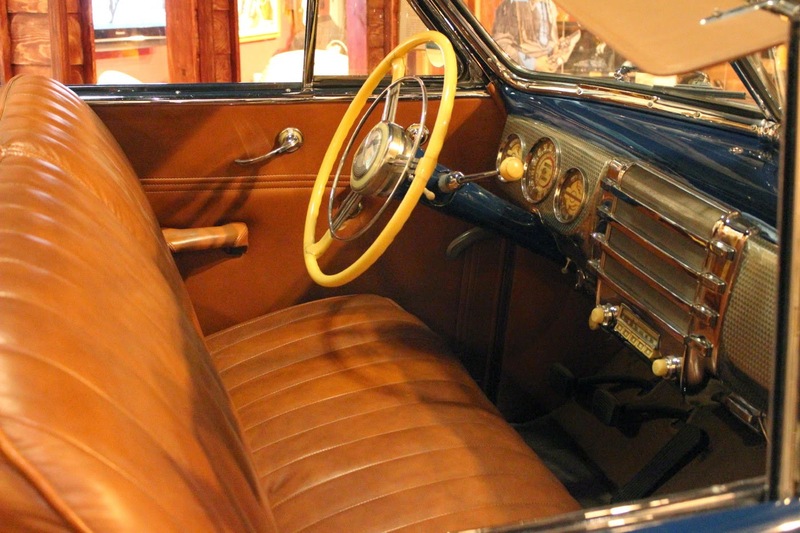 Love the classic interior, white steering wheel and all. Jan and I did buy a movie DVD. It was this one, Ride Lonesome starring Randolph Scott. It is supposed to have many scenes shot here. Some of our younger readers may be surprised to realize that some westerns earned stars oscars. 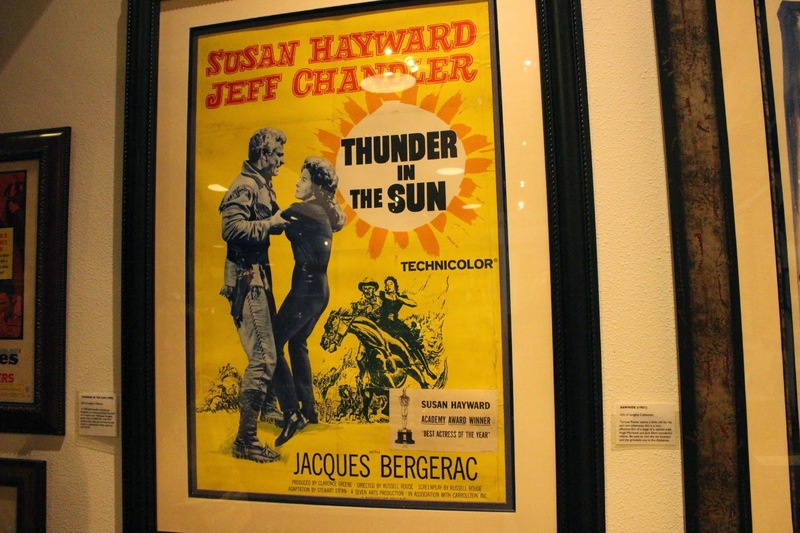 Susan Hayward won the best actress award in 1959 for Thunder in the Sun. 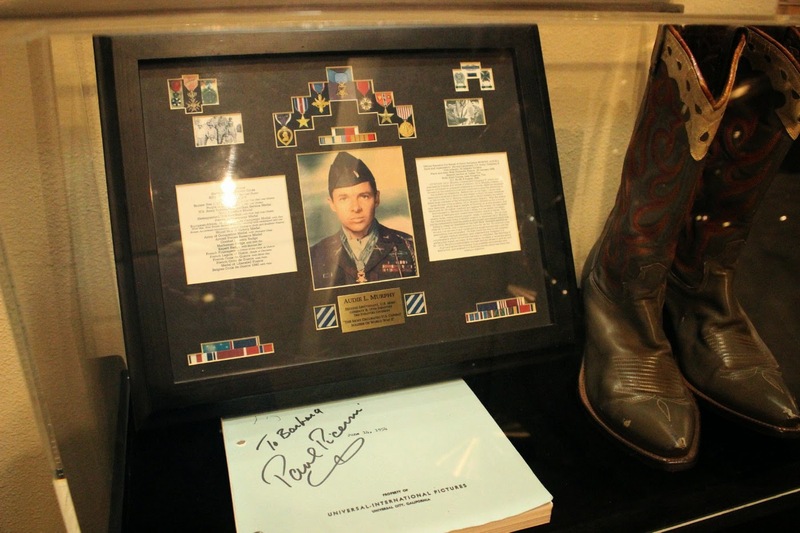 James Stewart we all know, but I'm not sure how many know of Audie Murphy. These two links connect to Audie Murphy websites. Murphy was the most decorated soldier in World WarII. After the war he starred in his own biographical movie To Hell and Back. 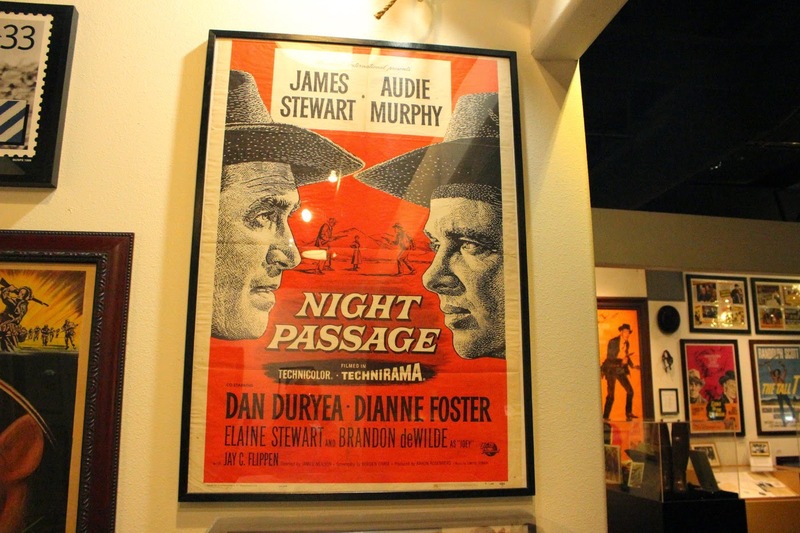 He acted in a large number of other movies like this one, Night Passage. Plagued by what is now known as Post Traumatic Stress, Murphy championed care for soldiers suffering from the disorder before he died in a plane crash in 1971. Django Unchained starring Jamie Foxx, Leonardo DiCaprio, and Samuel Jackson. 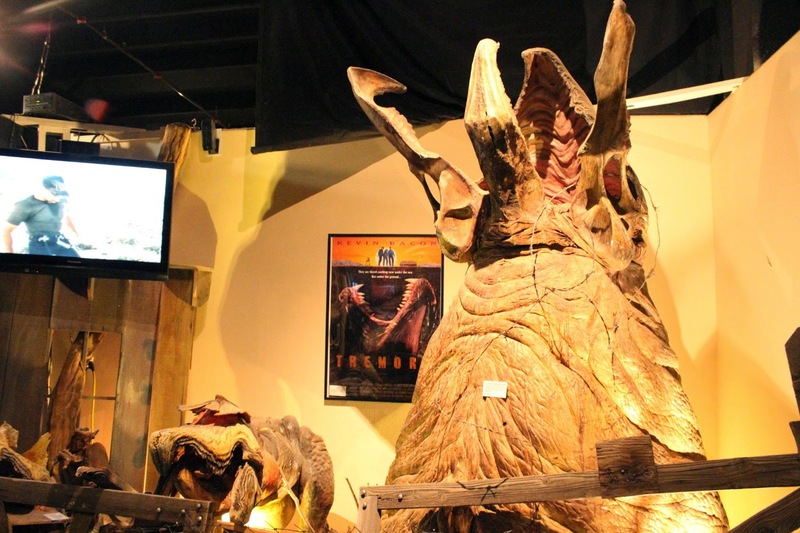 And yes, this is a prop from the iconic movie Tremors, starring Kevin Bacon. 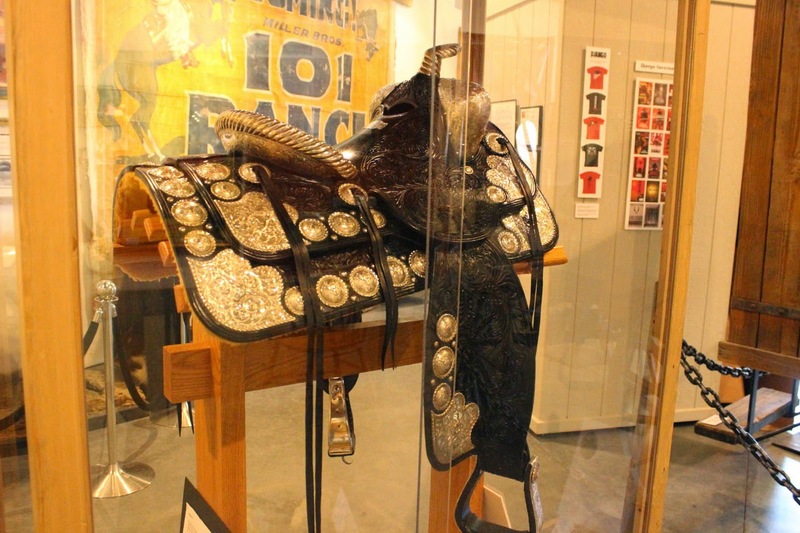 Another silver saddle from the Rogers collection. How does the horse even manage the weight?? 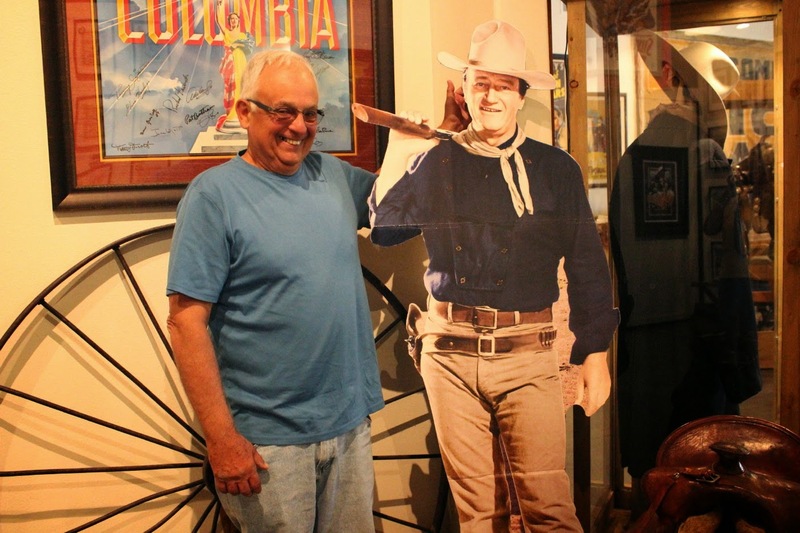 Even a few John Wayne movies were filmed here. And one of our all time action heroes, Steve McQueen. Nevada Smith was filmed in 1966 with McQueen, Karl Malden, Brian Keith, Arthur Kennedy, and Suazanne Pleshette( you might remember her from the Birds-Hitchcock movie--supporting role-Tippi Hendron was the female star,--or costar of the Bob Newhart Show. 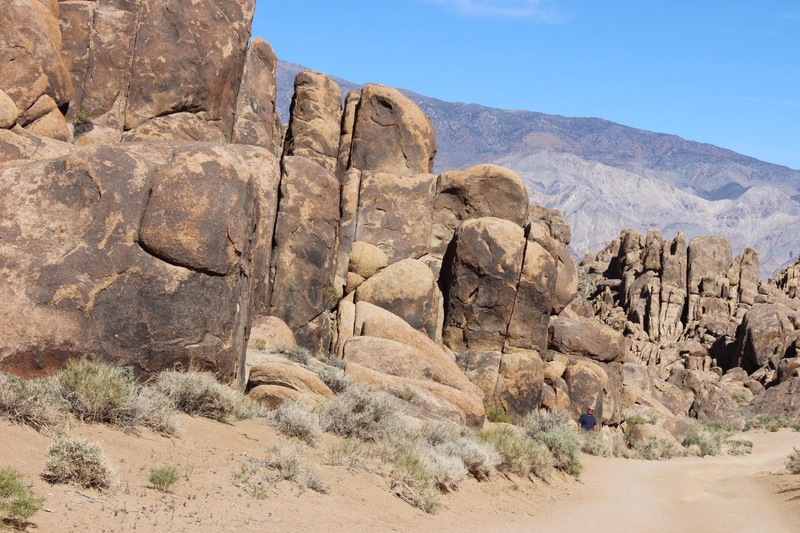 This is a section of the Alabama Hills right below our campsite. To understand how large these rocks are, make sure you can see Bruce in the lower right of the picture. Unlike the steep, sharply pointed peaks of the Sierras to the west, these rocks were worn down by millions of years of water. Great spot for a Western ambush. 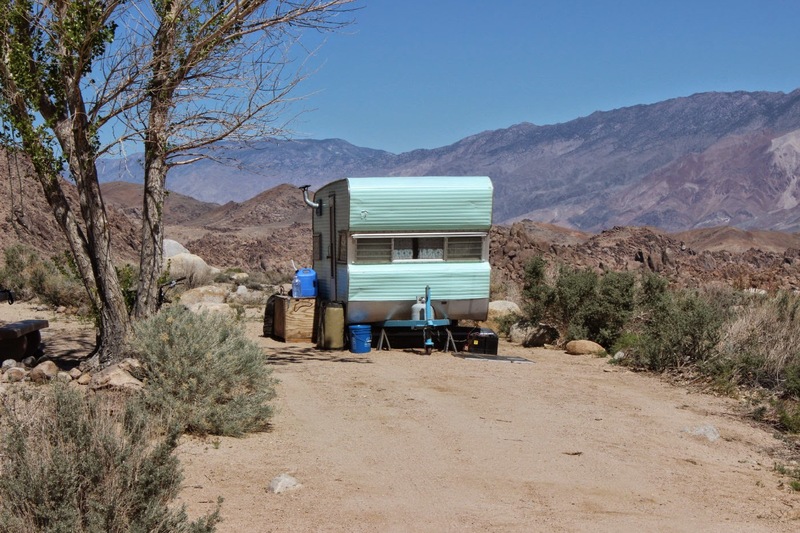 Less than a mile from the previous picture, this is still in the Alabama Hills(named by the 1800 prospectors for a Southern Civil War ship) looking at Lone Pine Mt. And that rock in the previous picture? Now you can see the rock climber who was having some fun that day. Had to throw in at least one fair shot of Mount Whitney! How did you ever climb this Marsha and Mark? And Dave?? We are parked at Movie Flat Road. In this area most of the hundreds of movies were filmed. In the background, even in black and white, these mountains including Lone Pine and Mount Whitney were breathtaking for the movies. Enjoy , Lady Blue! !